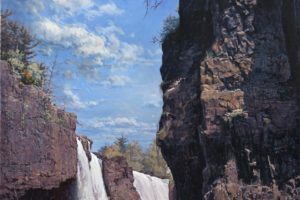 "Great Falls of the Passaic" by John Buxton, Oil 56in. x 35in. "Land of Abundance" by John Pototschnik, Oil 35in.x 65in. "Bright Morning Timberline Falls" by Kathleen Hudson, Oil 18in. x 13in. "Coastal Silhouette" by Kathleen Hudson, Oil 20in. x 24in. "Gentle Stroll" by Jacob Aguiar, Soft Pastel 24in. x 24in. "Sedona Sentinel" by Larry Cannon, Watercolor 10in. x 14in. "Rundle from Vermillion" by Linda Wilder, Acrylic 24in. x 36in. "Cloud Scenery" by Jiamo Xiao, Oil 24in. x 32in. "Plein Air in Jaipur" by Tuerxun Tuergeng, Oil 12in. x 16in. "Morning Light on Ruby Peak" by Leslie Leviner, Oil 12in. x 16in. "Jackson Falls New Hampshire" by Mary Jane Ward, Oil 8in. x 10in. "ChÉteau de Selles sur Cher" by Jingfeng Li, Pen and Ink 30in. x 20in. "Cindy's Gift" by Karen Hitt, Oil 10in. x 12in. "Wilberforce" by Cory Trepanier, Oil 90in. x 60in. "Harbor Lights Camden" by Mark Daly, Oil 24in. x 36in. "Australian Trumpet Beach Party" by James Newman, Acrylic 30in. x 48in. "Great Falls Potomac River" by Mary Jane Ward, Watercolor 9in. x 12in. "Kittitas Valley" by Steven Hill, Ball Point Pen 19in. x 29in. "Reminiscing" by Julie Riker, Oil 12in. x 16in.